Vanna K has designed a lot of beautiful jewelry over the years. We have several favorites, but wanted to know if the designer had her own personal favorite. We were delighted to see Vanna's favorite and to learn the story behind this beautiful aquamarine creation. Thirty years ago, Vanna's dad (founder of SA Kitsinian) acquired this beautiful 16 ct aquamarine gemstone from the famous Tucson Gem Fair. Since that time, he designed many beautiful pieces, but held this stone back for something truly special. That something special has finally been created by Vanna and we think it was definitely worth the wait! Set in 18k white & yellow gold, with 2.30 carats of Diamonds & 1.60 carats of Pink Sapphires, this ring is truly something to be admired. The whole family feels Vanna has captured the right emotion in the gorgeous setting for this ring. We asked Vanna what she used for inspiration in creating such a timeless beauty. The pink sapphires set within the yellow gold backdrop evoke memories of the fuchsia bougainvillea flowers that bloom so delicately out of ancient stone mountains, a perfect clash of feminine and masculine, only to be met by this deep-hued 16 carat aquamarine stone which represents the heavenly clear blue sky in this gem of a town! 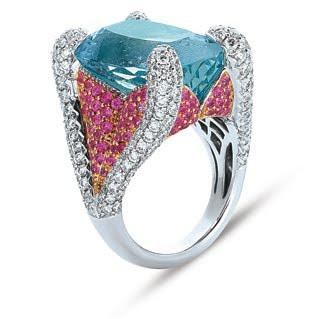 Like the place from which my inspiration was drawn, the harmony of the color tones on this ring are sure to take any woman who adorns this piece to another time and place surrounded by nothing but beauty." See more beautiful Vanna K engagement rings and fashion jewelry here.